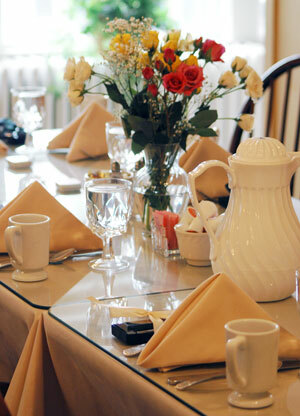 Thank you for considering the historic Beverly Golf & Tennis Club for your upcoming Wedding Reception. The Clubhouse at Beverly Golf & Tennis Club is rich in history and was built in 1910 as an athletic club for the employees of the United Shoe Machinery Corporation. We are proud to be on the Massachusetts Register of Historic Places as well as the National Register of Historic Places. The 100 year old stucco Scotch Tudor-style clubhouse still holds much of its original charm today. Twin staircases lead to The Great Room, perfect for Wedding Receptions, and can accommodate up to 150 guests. Impressive beams and authentic turnbuckles crisscross the 30’ ceiling. New Elevators have been installed to help our handicap guests. The Great Room also boasts large windows and antique skylights on all sides to allow for ample natural light. For an additional fee, our charming Veranda is available for your guests to enjoy the Cocktail Hour. Our prices are designed to take the stress out of planning by including all gratuities, taxes, room rental and incidental fees. Our staff and Wedding Coordinator will do everything possible to help you prepare for your special day so that you can relax and enjoy your family and friends. We hope that you will give us the opportunity to host your Wedding Reception, and we look forward to serving you at Beverly Golf & Tennis Club. to assist in planning for and overseeing your Reception.